Would you insure salary worth £1.2m? Something worth £1.2 million is very valuable indeed. Life changing. So why are the vast majority of working adults in the UK not insuring an asset with this financial value? My group of friends seems to have reached that stage of life now, that wherever I turn these days I cannot move for either babies, or weddings. A move has been made to wind up an Aberdeen school trust at the centre of a long-running multi-million-pound legal dispute. Aberdeen council leaders have refused to rule out outsourcing services. 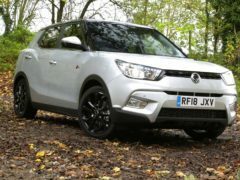 SsangYong is offering zero per cent finance and no deposit on its Tivoli and Tivoli XLV diesel models. A North-east council shelled out more than £370,000 on a sports and leisure trust which never saw the light of day. Twenty three Aberdeen council staff could be costing the taxpayer up to £250,000 a year as they take work cars home, a committee has been told. The leaders of Aberdeen City Council have written to Finance Secretary Derek Mackay confirming they cannot accept his finance settlement as it stands. New figures have revealed Aberdeen house prices are down by almost 4.5% – but experts believe they could be on the up for 2018. Both Aberdeen Art Gallery and Provost Skene's House have been delayed and likely won't open until 2019. Aberdeen City Council was today accused of “squandering money” after setting aside £30,000 for 75 new staff uniforms. A local authority is set to be £3 million over budget by April – and says a lack of council tax payments is partly to blame. Here's how to cure some common financial 'ailments'. Aberdeen councillors have approved plans to make savings of £25.5 million by changing the way its services are operated. Autumn is traditionally a time of year when the property market starts to get going again after the summer holiday lull – and for many house-hunters this will be their first ever step on to the property ladder. Plans are under way to save £25.5 million of Aberdeen taxpayers’ cash by taking successful ideas from across the UK. Almost £9 billion of public and private investment is due to be delivered to benefit the North-east before 2030, it was revealed today. If you lost money to a fraud, would you expect to get your cash back? Health chiefs are facing the challenge of shaving more than £27 million off all spending at a North-east health board – and the challenge has already got harder. A North-east health authority is set to rake in £27 million by selling off empty buildings in the next few years, new figures show. Less than half of council tax outstanding at the end of the 2012/13 financial year has been collected. A bus company has become the first in the North-east to offer a contactless payment scheme - meaning Aberdonians will no longer have to rummage in their pockets for exact change. A regimental museum is launching a £300,000 fundraiser in an effort to secure its future. Nicki Minaj has said she will pay some of her fans’ college tuition fees if they can prove they get straight A grades. Karen Clark We have already committed significant funds to assist some businesses facing massive business rates hikes. Aberdeen City Council had the third highest parking surplus in Scotland in 2015/16.